Koh Samui is the perfect base for a Gulf of Thailand voyage. Yachting visitors can enjoy the many attractions on this beautiful island while planning explorations to surrounding stunning islands. Great Gulf cruising waters await, but in the interim, there are lots to enjoy on Koh Samui. Changing from a ‘backpacker’ island 30 years ago, the volcanic island is now a high-end superyacht destination of superb dining, 5-star hotels & villas and pampering spas, while the island’s natural beauty and local attractions continue to enchant visitors. Captain Charlie of Asia Pacific Superyachts has been assisting visiting yachts to the Gulf for the past 20 years and would be happy to help logistics and to set itineraries. There are many attractions for visitors while your boat is based on Samui Island. A visit to the aptly named ‘Big Buddha’ shrine, a 12-metre high golden Buddha that can be seen from several kilometres, is not to be missed. The enormous statue overlooks a complex of rustic shops & dining options and, often, monks will read a visitor’s fortune. Right next to Big Buddha is ‘Wat Plai Laem’, a colourful and interesting Buddhist Temple featuring very ornate décor, art and statues set on the lake. The amazing ‘Secret Garden’ (or ‘Magic Garden’) is hidden away high in the hills in Koh Samui's interior, offering majestic views and an unusual collection of hand-crafted statues amid lush jungle surrounds constructed decades past to please the Gods by a local farmer. An excellent viewpoint restaurant is just a few kilometres away and in the area, are the two ‘Na Muang waterfalls’, the most picturesque of Samui’s waterfalls, with jungle treks and cooling lagoon swimming. Fisherman’s Village Samui with its rustic-style buildings housing boutique stores and trendy shops & restaurants, adds food, drink and souvenir stalls, lining narrow Beach Road during the famous ‘Friday Night Walking Street’ market. Other villages are now also featuring a weekly ‘Walking Street’, filled with great food and various stalls to explore. A 10-minute drive away is famed Chaweng Beach, with its vibrant nightlife. Anchored by the new ‘Central Festival Mall’, the main drag throbs with hundreds of restaurants, clubs & pubs, live music, fantastic beach road and ocean-front dining and entertaining Ladyboy cabarets. Koh Samui has one of the world’s most unusual and quite large natural geological formations, known as ‘Hin Ta’ and ‘Hin Yai’ Rocks (Grandfather and Grandmother), which look like male and female genitalia. Nearby is the Wat with the body of Samui's most famous mummified monk on display, ‘Luang Pordaeng’. He died over 25 years ago and as instructed his body was placed in a specially designed glass case for posterity, where it has remained ever since with few signs of decay. 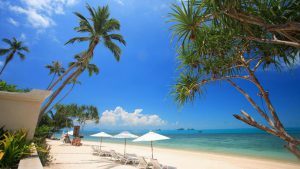 Koh Taen (Koh Tan) is the closest Island from Koh Samui, located on the southwestern coast of Samui, across from peaceful Taling Nam fishing village. It is a small, unspoilt island, known for its coral and marine life. Giant clams, fan corals and a wide variety of fish species live in and around the protected reefs. On the island is a small village and there are no cars or roads. Leave your yacht and take a local long tail fishing boat at Thong Krut Fishing Village. Koh Matsum is south of Koh Tan opposite the beach at the ‘Laem Sor Chedi’ and Pagoda cultural attractions. There’s a long sandy beach for picnics and singing songs around campfires. Visitors sometimes join the locals camping out on a ‘tio’ (‘day out’). Five Islands are truly a treasure. These islands are protected by Sea Gipsy guards as the rare bird’s nests found there is the principle ingredient of the famous Chinese bird-nest soup. Arriving for scheduled stays on the island, talented Chinese climbers sort their way up a web of bamboo poles to reach nests for which Hong Kong restaurants will pay up to $4000 a kilo. Five Island restaurant is a great place to watch the sunset while enjoying chilled drinks. Ko Chang is one of Thailand's most beautiful islands with long white sandy beaches, many half-deserted. The island is also home to a wide range of wildlife and numerous small islands surrounding the main island are great places for snorkelling, diving, and sea kayaking expeditions around the archipelago. Ko Samet is the largest and westernmost of a cluster of islands. Most of the island is in the Khao Laem Ya–Mu Ko Samet National Park. Declared a National Park in 1981 and under the protection of the National Parks Division of the Thai government, this is an excellent nature study and trekking island. Golden sandy beaches, secluded bays, and a scuba diving paradise, Koh Tao is one of Southern Thailand's true tropical island escapes and Thailand's #1 scuba diving destination with some of Asia's most famous dive sites located around this beautiful island. Koh Tao is reminiscent of Koh Samui several decades ago and is unique both above and below the water. 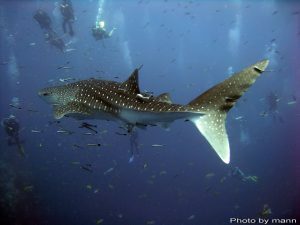 Offering hard and soft coral reefs, pinnacles and large pelagics, all in 24° sea water, many divers also can swim with massive whale sharks that frequent the offshore pinnacles at certain times of the year. Mu Ko Ang Thong is a marine national park in the Gulf of Thailand, an archipelago covering 42 islands of 102 km², almost all uninhabited with most of the islands consisting of limestone mountains about 10-400 meters above sea level. As limestone can change its structure easily by both chemical condition and weather, the islands have many strange-looking caves and cliffs and perfect for sea kayak expeditions into the mysterious caves. Those fortunate enough to explore by yacht will thrill to this unique ancient archipelago. Following extensive lobbying by the superyacht industry, the Thai Temporary Charter License received the Royal Decree. The new Charter License laws permit visiting foreign flagged superyachts (only those 30 metres and above) to apply for a license which will enable them to operate commercially in Thai waters; valid for one year. During this time a yacht will be able to cruise and charter in Thai waters. Applications for a license must be made to the Ministry of Transport, through an appointed Thai agent. Until now a superyacht that exclusively visited Thai destinations as part of a charter could only do so if it were Thai-flagged. 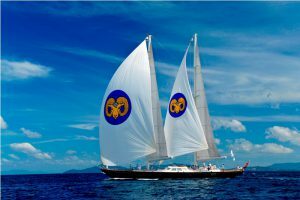 Under the Thai flag, an import tax of 7% of the value of the yacht was payable, and a Thai captain and engineer employed, with severe penalties in case of a breach. Now foreign flagged superyachts with the charter license may now operate a full charter in Thai waters with licenses valid for 365 days and are non-extendable nor transferable. The yacht may freely leave and re-enter Thai waters for the duration of the permit. In a second welcoming move, the Thai government ministries have stated that proposed changes to crew visa regulations are expected to be in place this year. Check with your superyacht agent for updates and to apply for a license.